UPDATE: It would appear that, Mr Fuhrmann who originally had the listing on his website has now removed all traces of the job/Sonic Mach 2 from his work history page. Come to your own conclusions, share them in the comments. 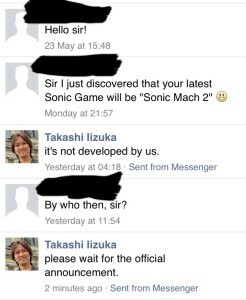 ORIGINAL STORY: Sonic Team head Takashi Iizuka may have confirmed that the rumoured upcoming “Sonic Mach2” is not developed by them, which leaves plenty of questions as to what the title could possibly be, and the legitimacy of its existence. A few days ago a thread appeared on our forum, the SSMB, indicating that a new Sonic title could be in the works. 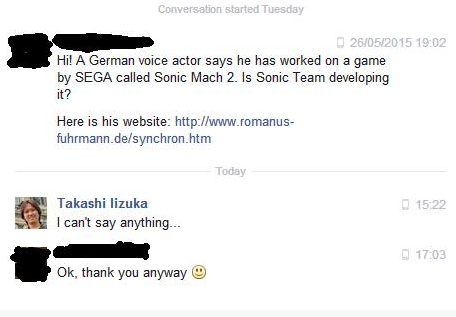 A find on the website of Orbot’s German voice actor, Romanus Fuhrman, listed he had lended his voice for an upcoming 2015 video game named simply “Sonic Mach2”. While initial discussion considered the fact it could just be related to Sonic Boom, it’s important to note that Orbot did not appear in either Sonic Boom video games, both have already released in Germany fully dubbed, and the title is listed under “video game”. Which now begs the question for all of us – what is “Sonic Mach2”? We’d love to hear your speculations in the comments. Could this be another mobile developed title from Hardlight (who previously gave us Sonic Dash, Sonic Jump Fever) or could we be seeing some of those free to play Boom titles we heard of previously? Sound off below and lets get some discussion going. Special thanks to Spindash.de for the inital finding and Blue Paradox on the SSMB for the screencap. You can see Romanus’ website here, where the title is still currently credited to him.